NASA, USA - April 09, 2018 - In the early morning hours of May 5, millions of Californians will have an opportunity to witness a sight they have never seen before - the historic first interplanetary launch from America's West Coast. On board the 189-foot-tall (57.3-meter) United Launch Alliance Atlas V rocket will be NASA's InSight spacecraft, destined for the Elysium Planitia region located in Mars' northern hemisphere. The May 5 launch window for the InSight mission opens at 4:05 am PDT (7:05 EDT, 11:05 UTC) and remains open for two hours. NASA's InSight to Mars will be the first interplanetary launch from America’s West Coast. Residents in some of California’s coastal communities could get a front row seat when the mission launches from Vandenberg Air Force Base. Here’s when and where to see it. In the early morning hours of May 5, millions of Californians will have an opportunity to witness a sight they have never seen before – the historic first interplanetary launch from America’s West Coast. On board the 189-foot-tall (57.3-meter) United Launch Alliance Atlas V rocket will be NASA’s InSight spacecraft, destined for the Elysium Planitia region located in Mars’ northern hemisphere. The May 5 launch window for the InSight mission opens at 4:05 am PDT (7:05 EDT, 11:05 UTC) and remains open for two hours. “If you live in Southern California and the weather is right, you’ll probably have a better view of the launch than I will,” said Tom Hoffman, project manager for NASA’s InSight mission from the Jet Propulsion Laboratory in Pasadena, California. The United Launch Alliance two-stage Atlas V 401 launch vehicle will produce 860,200 pounds (3.8 million newtons) of thrust as it climbs away from its launch pad at Vandenberg Air Force Base, near Lompoc, California. During the first 17 seconds of powered flight, the Atlas V will climb vertically above its launch pad. Then it will begin a pitch and yaw maneuver that will place it on a trajectory towards Earth’s south pole. “After lift-off from Vandenberg’s Space Launch Complex 3, the Atlas V begins a southerly trajectory and climbs out over the Channel Islands off Oxnard,” said Tim Dunn, launch director for the Launch Services Program at the John F. Kennedy Space Center in Florida. Mach One occurs 1 minute and 18 seconds into the Atlas V’s powered flight. At that time the vehicle will be about 30,000 feet (9 kilometers) in altitude and 1 mile (1.75 kilometers) down range. Two minutes and 36 seconds later, the Atlas first stage will shut down at an altitude of about 66 miles (106 kilometers) and 184 miles (296 kilometers) down range. The Centaur second stage (carrying InSight inside a 40-foot-long payload fairing) separates from the now-dead first stage six seconds later. Ten seconds later, the Centaur’s engine kicks in with its 22,890 pounds (101,820 newtons) of thrust, which will carry it and InSight into its 115-mile-high (185-kilometer) parking orbit 13 minutes and 16 seconds after launch. This parking orbit will last 59 to 66 minutes, depending on the date and time of the launch. The Centaur will then re-ignite for one last burn at one hour and 19 minutes after launch, placing InSight into a Mars-bound interplanetary trajectory. Spacecraft separation from the Centaur will occur about 93 minutes after liftoff for the first May 5 launch opportunity as the spacecraft is approximately over the Alaska-Yukon region. InSight's launch period is May 5 through June 8, 2018, with multiple launch opportunities over windows of approximately two hours each date. Launch opportunities are set five minutes apart during each date's window. 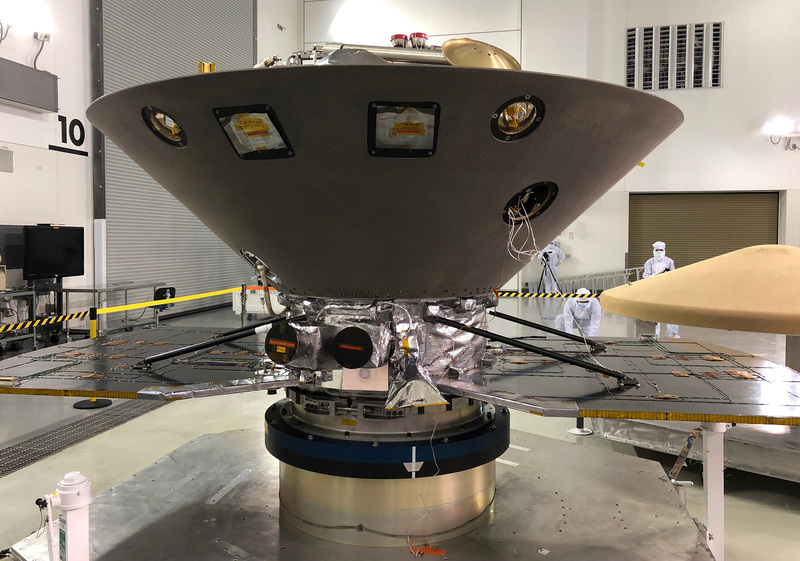 NASA's Interior Exploration using Seismic Investigations, Geodesy and Heat Transport (InSight) lander will study the deep interior of Mars to learn how all rocky planets formed, including Earth and its moon. The lander's instruments include a seismometer to detect marsquakes and a probe that will monitor the flow of heat in the planet's subsurface. NASA' s Jet Propulsion Laboratory in Pasadena, California, manages InSight for NASA's Science Mission Directorate. The InSight spacecraft, including cruise stage and lander, was built and tested by Lockheed Martin Space in Denver. NASA's Launch Services Program at the agency's Kennedy Space Center in Florida provides launch management. United Launch Alliance of Centennial, Colorado, is NASA's launch service provider of the Atlas 5 rocket. A number of European partners, including France's Centre National d'Études Spatiales (CNES) and the German Aerospace Center (DLR), are supporting the InSight mission.